Welcome to this issue of EAGLEyeONE Magazine! 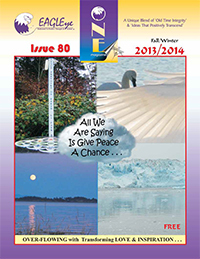 Click the links or symbols below to view this issue's articles in plain text. You may now view our articles and actual magazine pages as PDF's! Just click on the below. It is truly a time to reflect and soak up the light that surely surrounds us at this time of year. In some respects the clearing out of the old often �appears� to be an uncomfortable position on our personal tree of life. And yet when we dig a little deeper...allow the grace of living in the moment to fl ow through us, we are gifted beyond our wildest imaginations. New birth replaces our losses. Treasures of accomplishment rise up from the ashes of our ongoing struggles while victories surprise us with their spontaneous arrivals. Like the sleight of the magician�s hand, we are presented with opportunities to marvel at the wonder of who we are and how we are supported along the way. We have many pages in this issue devoted to sharing what a great place planet earth is and what amazing people tread the path with you. Little stories here and there hoping to remind you that indeed you are not alone. Like spring seeds laying dormant and the small buds ready to blossom, this is the season where your own determination will cause you to succeed. In the fi nal analysis, when you lay down at night and wake in the morning, your desire to try to BE the Best that you can be, will be your best friend. We are always presented with an opportunity to STarT FRESH with another day. The journey of the small seed is not always an easy one. Pretty little birds sometimes prefer to transform it into food for open beaks, the wind oftentimes scattering the seeds elsewhere. Still, the little seed merges with a spark of light and a drop of water to create new life... and so it is with us. May the garden within you fl ourish and prosper now, and the gardener in your heart tend to your life with a renewed love for yourself...so that each of your beautiful facets will light up in your unique magnificence! And let it spring from love Born out of concern for all beings. On February 22nd/07 I loaned $25.00 to Margaret Atieno. Margaret is married and has two young children. She�s been running a small food store for the past two years. If she can help her business become a bit more successful she hopes to educate her children, build a permanent home for her parents and maybe buy her mother a cow. She needed $650 and with the help of 20 others from England, the U.S. and Canada we were able to get Margaret her money. It�s the fi rst time I ever lent money to someone in Africa, actually Kenya. But thanks to an organization called Kiva, once I decided Margaret was the person I wanted to help grow her business, the whole process took a few clicks of the mouse and only two minutes. Then I loaned $25.00 to another food supplier, Madame Ahondjo Ama in Togo. Again I was just one of several people who loaned a total of $1,000.00 to this entrepreneurial woman. Imagine my surprise when I was notifi ed by Kiva in early June, that over 25% of the loans to these women had already been re-paid. When the loan is paid in full the funds will be disbursed to the lenders or we have the option to fi nance another applicant. So now over a year later, the loans were fully repaid, and I bet you can guess what I did with my returned $50. I have assisted a half a dozen people now, simply by rolling back in, my original $25 x 2. The founders of Kiva, Matthew and Jessica Flannery, are both Stanford grads. They came up with the idea for Kiva (which means �unity� in Swahili) after visiting East Africa. They noticed that many people had no access to affordable credit. They were familiar with the work of Nobel Peace Prize winner Muhammad Yunus, a pioneer in the fi eld of microcredit. Was there a way to make that work here as well? The Flannery�s used the power of the internet and the combined skills and creativity of friends and colleagues around the world, to introduce people from resource rich countries to people in resource poor countries and allow a dollar to go a long way. Their dream was to create partnerships as opposed to charity and to allow the lenders and the borrowers to get to know each other. Now, anyone can put a few dollars where it does a world of good. Kiva provides photos and bios of the entrepreneurs and lenders. You can choose to loan funds anonymously, which was my original idea, but after exploring the website I realized that it was more meaningful to see the faces of the lenders as well the borrowers. If I liked knowing something about who I was loaning money too, perhaps they would like to know something about me. Although Kiva is headquartered in San Francisco, it works with local vetted organizations that manage candidate selection, loan distribution and repayment. At this time the repayment rate for loans is 100%. I was blown away. To learn more, I watched a special report from PBS Frontline called Uganda: A Little Goes a Long Way. The diagram below shows briefl y how money gets from you to a developing-world entrepreneur, and back. 1) Lenders like you browse profi les of entrepreneurs in need, and choose someone to lend to. When they lend, through PayPal or on their credit cards, Kiva collects the funds and then passes them along to one of our microfi nance partners worldwide. 2) Kiva�s microfi nance partners distribute the loan funds to the selected entrepreneur. Often, our partners also provide training and other assistance to maximize the entrepreneur�s chances of success. You always are notifi ed when they make their monthly payment, and occassionally with something more personal. One person sent a letter midway through his loan saying thank you to those who helped him. He was celebrating the reuniting of his family which was the result of his business expansion due to the help of his Kiva friends. Is there a chance you will never see your money again? Of course. There could be many reasons, from war to monsoons, as to why people may not be able to keep their promises, just like in Canada, things happen. However, it would be rare, versus the norm here. But with the possibility of my $25 doing so much good, I�m willing to trust! For 3 years now we have been drumming for the whales. It all started when I facilitated a study group based on Sandra Ingerman�s book �Medicine for the Earth - How to Transform Personal and Environmental Toxins�. One of the exercises was to get in touch with the consciousness of a big mammal, so of course we chose the Orca. When we shamanically journeyed to the Orcas we received disturbing messages - �our skin is itching because of the pollution in the water, we can�t hear each other anymore because of the noise, there�s not enough food anymore...� and we all jumped up - what can we do? How can we heal them? After some brainstorming we decided to ask them what we could do and the answers we received were amazing. �We don�t want to be fi xed or healed and you can diminish our suffering by living more consciously in your everyday life. If you want to help us, come to the beach and drum for us... no healing or fi xing needed... just acknowledge what we are going through�. So we packed our drums and headed to the beach. The more we acknowledged the pain and suffering of our nonhuman brothers and sisters the more we had to work through our own pain. There were times when we stood at the edge of the ocean and all we could do was drum and cry, salty tears joining the salty waters, and the mutual healing was tremendous. After continuing indoors during the winter we returned to the beach as soon as the evenings were warm again and we could feel how the whales solemnly welcomed us back. They understood the value of the personal work we were doing and they liked our faithful commitment to making a difference in the best way we could, not to mention our love for the earth. And this year there were less dead sea creatures washed ashore, and seals and porpoises often came close to listen. Every circle had a different teaching, a different gift, but there�s one that�s still vivid in my memory. We drummed as usual but there was a very special energy surrounding us: strong, powerful, knowing and joyful. Everyone felt it and it was so hard to close the circle that evening. Nobody wanted to stop even though it got dark and the air was chilly. When we fi nally parted I took the way along the beach to share my overfl owing heart with the water and all the creatures it nourishes. Something colourful caught my eye in the dimming light. When I picked it up all I perceived from it was tremendous joy and gratitude. It was already too dark to fi nd out exactly what it was so I carried it home. It was a branch of sweet pea fl owers. There were nine of them and there were nine drummers that evening. Each one of these fl uorescent pink blossoms sent out so much joy and gratitude, a message from the conscious universe acknowledging us, acknowledging our love and caring for the earth and all her children. The sweet pea and I looked at each other while I fi lled a little vase with water �thank you� we both said �thank you� for the dance, thank you for being able to see me and thank you for being able to acknowledge me. The next morning a friend called and told me that she was late for the circle so she watched from above the cliff. While we were drumming at the edge of the water there was a pod of whales swimming in the glow of the setting sun. It seemed that they danced to the beat of the drum. It was such a powerful experience for her that she needed to be alone and could only share it with us the next day. Whale energy... mutual gratitude for sharing the dance of life with each other. No, we are not alone! Our breath is so vital to life, that to go without for even a short period of time, can either end life or cause serious harm to the bodily systems. After only four minutes without oxygen, brain function will be seriously impaired. And yet, as important as our breathing is, it is something most of us are doing unconsciously, without even thinking about this most important life giving action. Life in the 21st century produces many demands on us and we are constantly under great stress. Many of us are so used to operating under this stress that we believe it is normal. When the human body is under stress, it responds by taking shorter, shallower breaths. This shallow breathing deprives us of the oxygen that is necessary to maintain our bodies, minds and spirits in a healthy vital state. If we are not breathing consciously, we are not breathing deeply enough. When we are not breathing consciously, we are letting the unconscious part of our self govern our lives, and we become like robots. How often have you done something on automatic without even thinking about it? So what happens when we open ourselves up to the mysteries of Breath Work? Taking four deep and conscious breaths in a row can have a magical effect. It helps us to connect to source energy, to our higher consciousness, to our spirit and more. In Hawaii this breath is called Ha (pronounced: Hah), meaning �Breath of Life�. The �Breath of Life� is and can be used in many ways, including stress relief, to boost the immune system, for greater positive energy, release of old negative patterns, improved ability to reach goals/aspirations, deepen spiritual enlightenment, as well as physical healing and pain relief. To not practice conscious breathing, is to ignore the most powerful healing tool that you possess. It is impossible to act unconsciously when you are breathing consciously! The �Breath of Life� as part of our daily practice assists us with our basic human emotions, allowing our feelings to pass through the body, rather than holding onto them. Conscious breathing not only builds physical energy and endurance, it can also prevent many physical problems. It is only through conscious breathing, that we can be fully present in the moment. In meditation, focusing on the breath allows the mind to stop wandering and allows our consciousness to expand. In spiritual practice our intention is to deepen our connection to source energy, and all metaphysical teachings point to the power of breath to achieve self-mastery. JANUARY: : Let go of all that feels old, including thoughts! This clears the way to welcome fresh new opportunities that will energize you. FEBRUARY: Movement and change is in store for you simplifying your life in many ways. Surrender and trust are the keys! MARCH: Your energy is being fi ne-tuned and aligned for certain changes. Being open and aware is all that is required! APRIL: You are presently preparing for shifts of newness. Simply be open and alert; you will end up where you are meant to be! MAY: : An expansion is taking place within your circuits allowing you to align with others of your clan. This brings you delight! JUNE: : You are aligning with synchronicities that fl ow with ease. Be open to receive; you will enjoy what this brings! JULY: Shifts in your own perception are unleashing new aspects of self. Continue to allow this to unfold; new opportunities will be gifted! AUGUST: : Completions are taking place on many levels. These refi ne & defi ne your future enabling you to move forth with a refreshed energy! SEPTEMBER: : Aligned energies are holding & supporting you; there is nothing you need to do other than to act in the moment. Such relief! OCTOBER: The new vibrations are easing your way bringing pieces together in natural alignment. Joy and peace is your reward! NOVEMBER: You are meeting members of your clan. These encounters are life altering; feel blessed this time has come! DECEMBER: Many things you have recently experienced have brought you gifts of wisdom. Share these with others; you will feel fulfi lled by doing so! Any time is an awesome time for spiritual resolutions, not just January, but how about every Monday? How about the first of every month? Or the third Saturday? Most people like to have a starting date when they set their resolutions. What makes a spiritual resolution different is that you can do it anytime, and the focus is on your spirit and what you�ll resolve to do to make sure you�re nurturing it so you feel good all the time. In a traditional New Year�s resolution, most people are moving �away from what they don�t want�. For example, I�ve heard people say things like, �I�d like to quit smoking; stop overeating; leave the job I don�t like; get rid of negative people in my life; I�d like to spend less money.� So, what�s common with all these traditional resolutions? They�re all focusing on things and behaviors we don�t want. As we focus on anything negative or positive, of course the Law of Attraction will create more of the same. So when you say you want to stop overeating, you�re giving attention to overeating, and when you say you want to get rid of negative people, you�re giving attention to negative people. Spiritual resolutions are different. They are intended to make a commitment to your spiritual development or growth. They�re intended to nurture your spirit. They are expressed in terms of �what I do want�. For example, the opposite to quitting smoking would become to have healthier lungs; to stop overeating would become adopt better eating habits and getting rid of negative people would become attracting ideal positive people. So what�s different about these resolutions? They�re reworded so that you move �towards� what you do want, which then sets the energy in motion. In talking with others about their spiritual resolutions there were many variations. One person said they were going to resolve to subscribe to spiritual based magazines. Another resolved to join a Law of Attraction discussion group that will nurture their spirit. Some said they would find a buddy to celebrate their successes with every week. Someone else resolved to go to the Dollar Store, buy a journal and commit to writing in it twice a week.The reality is, it doesn�t matter what you choose, as long as you choose to set the energy in motion. It is truly extraordinary to consider what a difference one person can make � and now, MANY people. After fi nishing his own cancer treatment, and understanding the need for support, Brian McGregor did something As the founder of Cancervive, Brian, with many others, has been raising support for Canadian cancer survivors and their families. The Cancervive Foundation is a non-profi t organization. Their mission, through hope, inspiration and commitment, is to work together in support of those living with and surviving beyond Cancer. Completely volunteer based, one hundred percent (100%) of all donated funds are directed to local Cancer Survival programs. The Cancervive Peloton Project (CPP), their fl agship program, humbly began after an epic cycling trip with a group of biking friends. Together they rode from Calgary to Austin, Texas with 30 cyclists riding in pelotons of six riding relay style. 2,400 miles over eight days! The Cancervive Warrior Program embodies the organization, the riders, volunteers and any others who have impacted Cancervive. Warriors are the special guests of the 30 cyclists who will be fl own to Philadelphia-the 2008 target, to meet the riders. The cyclists arrive in Philadelphia in time to unite with their Warriors and thousands of other participants from around the world to participate in Lance armstrong�s LiveSTRONG� charity bike ride to celebrate Survivorship. The journey through Cancer treatment can be a spiritual drain on patients and their families. The Warrior Program offers some relief and at the same time gives a dose of hope and inspiration. The effort has impacted many people, young and old in many different ways. The photo here is from the 2007 peloton...it should touch your heart for if you look closely you will see that one rider is being powered by the others to make it up the hill. This ride is all about the power of working as a team, of never giving up whatever the weather. The peloton (from French, literally meaning ball and related to the English word platoon) is a large main group in a road bicycle race. Riders in a group save energy by riding close to other riders. The reduction in drag is dramatic; in the middle of a well-developed group it can be as much as 40%. The peloton travels as an integrated unit, much like birds fl ying in formation, each rider making slight adjustments in response to the riders around them (particularly the one in front of each). Riders at the front are exposed to higher loads, and will take turns as they slip off the front in order to re-join the pack further back. The shape or formation of the peloton changes according to many factors. A strong headwind or a hard effort tends to spread-out or string-out the riders, while a slow tempo or tailwind tends to bunch up the peloton into a wider formation. Side wind forces the peloton to form into echelons in the direction of the wind. This year the Cancervive Team will ride 2,800 miles over NINE days from Calgary to Philadelphia in August. That is in relay 24 hours a day, Riding this year, will be a woman by the name of Nancy Wright! Why are we sharing this story with you? Simply because ONE Magazine is actively supporting Nancy Wright in this years ride. Who is Nancy Wright you ask ...and why should we care? Nancy Wright is a volunteer team member of Wellspring Calgary. She is a mother with a heart that beats for more than just herself and her family. Nancy has been inspired to take up the challenge to peddle day and night for 2,800 MILES. She committed to begin a rigorous training program to get in shape, to work as a team so she can complete the ride. I was personally very touched by this dedication of an �ordinary person�, who no doubt wonders like the rest of us, on occasion, how to juggle her own commitments. Still she was moved from a deep place within to �just DO it� anyway. She was moved to show support in a tangible way for �her warrior� and all the others. What does that warrior word mean again? A Warrior is someone who has fought or is fi ghting the battle against cancer, someone who cannot ride for themselves. A warrior is a person who inspires the rider to peddle for nine days to celebrate in the victory...in the spirit and hope for new life for themselves and also for many others like them who will benefi t from this ride that raises money to support ordinary people and assist them through outrageously life changing times. Nancy Wright chose a warrior who is also the kind of person who lives from the heart and soul of life just like she does. A person who constantly �goes the extra mile� for others. Many of you will nod in agreement when I share with you that her warrior is Trudy Boyle. That name will �sound familiar� to many of you, and so it should. Trudy Boyle has been writing articles for you under Constructive Living on page 4 for close to 15 years now. In fact, Trudy Boyle has contributed an article for EVERY issue we have ever printed, count #65 on the cover of this one. Imagine, Sixty Five Deadlines over fi fteen years and still writing... whether she �felt like it� or not. She made time to do her best to help our readers rise up above old habits and perhaps see alternative ways of approaching life together in a positive manner. I KNOW she has changed many lives for the better through these pages over the years and I know she has been a friend. I know this, because many of you have called and emailed to say so! I can also add, that from the day I was born, she has consistently infl uenced my life too. How so? Trudy Boyle is my sister. The fact that Trudy is now Nancy�s warrior will indeed shock some of you. How can she be a warrior? Well, just like many of you, one day Trudy went to bed healthy and the next day received the news that she had cancer. Yes she is a �real warrior� alright and even now, lights and holds another kind of torch in the hallways of the chemo ward. By the time you read this, her hair will have fallen out. Gone with the wind, for the next 100 days, with eyebrows and eyelashes soon to follow. No doubt the same wind the Cancervive Riders will sometimes peddle against and sometimes fl y within. A wind of hidden blessings. As a rider, Nancy Wright had to commit to personally raise $10,000 for Wellspring Calgary. Wellspring Calgary is a place that is supporting Trudy in her quest for renewed health. Raising $10,000 is a requirement for every rider. That�s a lot, but I believe WE can help Nancy raise a portion of that money for her ride for Trudy. I believe we can do it in the spirit of ONE. So in LIGHT of the service Trudy has contributed to us over the years, as a small token of appreciation, I am now prepared to have my healthy head of hair shaved off to raise funds for this event. I�m sure it won�t be a pretty sight, as old scars surface once again...but a small price for me to pay in the long run, if it inspires you to support Nancy�s Warrior ride for Trudy. Yes, I AM hoping some of you out there will be inspired to donate a little �something to this cause�. Imagine what a difference MANY people can make by helping in a small way. Think about it, if 100 people who had been blessed by Trudy�s goodness over the years, threw in $20 (a night at the movies or a supper out) we�d have $2,000. What about $5 or even a Loonie!... We�ll appreciate anything...large and small donations...TOGETHER they will all add up to success. You have 3 ways of doing this. 1. Write a cheque made out to Wellspring Calgary and send it to EAGLEyeONE 105 Machleary St Nanaimo BC. V9R 2G5 2. Drop off your donation at the above address. 3. Log onto our website www.EAGLEyeONE.com and get forwarded to the Cancervive site and donate with a credit card. Make sure you choose Nancy Wright in the rider menu. Wellspring is a registered charity so please provide us with your mailing details as donations $20 and more are tax deductible. And THANK YOU in advance if something in your heart says YES! Communication is defined as a process that allows the exchange of information based on a common language. In this age the most common language is no longer defi ned by a spoken dialect or calculated by the number of people who speak English, French or Mandarin. It is based on a more global language, a new language whose system of communication is owned by no one. A system that has the potential to eliminate boundaries between people, this communication system is called the World Wide Web. Also known as the Internet, this system is accessible to everyone, a common tool to interact with the world truly from the palm of your hand. The Internet is a dynamic community of information that looks similar to a spider�s web. A web is composed of an expandable number of strands that connect each section to each other and to the whole. All people who use the internet are the masters of their own experiences; they sit at the center of the web. Using the internet one can do research, learn, interact with others, express opinions, share insight, offer services, play games, display art and basically anything one can think of. Information is stored in a linkable container identifi ed by a chosen name (address) that is called a web site. Each web site that contains any kinds of information works like an electronic book with a table of contents, chapters, pictures and an index. Imagine you could open a book to the table of contents and simply by touching an element showing on page 37 the book would automatically open to that page. The whole book has these links creating connections within itself and to the outside, to other related books. You can dynamically move through the information based on your own chosen adventure. The Internet is an interactive, self guided, automatic adventure of information. Imagine the possibilities when a great number of people come together to execute change. The internet is a tool that can bring the world together under one roof, a system of unity. With the internet mimicking aspects of the real world, there are good websites and fraudulent websites. Information on a website is not verifi ed by anyone so please don�t believe everything you read just because it is in print. There are billions and billions of web pages on the internet and it is important to be aware of how to keep yourself safe while cruising the net for information. Here are a few things to know to keep you safe when cruising the internet. 1. Buying online using a credit card is fi ne but make sure you know who the company is before you do. A business web site is linked to someone, so a company you are unfamiliar with is worth doing your research about. When in doubt don�t buy online. 2. Emails requesting information from legitimate companies and banks requesting passwords, account numbers or login information are all Fraud. No company will ever ask you for this information over email. 3. Unfortunate to say but any email you receive that says you have won a million dollars or a trip for two to paradise, just click here to continue is also Fraud. 4. Create a separate email address to use for all internet inquiry registrations. Most people receive spam from registrations they have initiated over the internet. If this email starts getting lots of spam, delete it and start over. 5. Don�t just say yes to everything � read pop-ups and understand what you are saying yes to. There are a lot of reasons why you need to install programs or download fi les but viruses also come in these forms. If you are unsure why you are being asked to download something, �Google It� and learn what it is. What is �Google It�? Well, as the internet has billions of web pages some of you may be asking how on earth do you fi nd anything. Great question! Search Engines like Google (www.google.ca) are designed to organize the internet for you based on what you are searching for. They look at every web page and fi nd the web sites they think are most relevant and arrange them in a list for you to choose from. This is how you fi nd information on the internet as you will not know the address of every website you are interested in. However, you will start to have a few �favourites� as time goes on. The internet has become a central station for communication around the world. It does have its own culture and the W3C (World Wide Web Consortium) has created rules to ensure that this amazing tool is accessible to all people. The World Wide Web is a dynamic collaboration of information and services that has changed the way we access information. In the future we may start to see internet stations on the street just like we�ve gotten used to pay phones. The Internet removes boundaries between people, communities and nations. Imagine the goodness of a point and click system of life that has the potential to unify and advance the circle of humanity. Longer days and longer nights, what a gift, and what good timing. You�re going to want more of the above so you can sit on the front porch and read or walk in the park with new music to inspire you. In light of the season, we have some new releases to share with you. If you�d rather stay at home and play with your computer (you can run a CD there too) then check out The Wild Divine. Now that�s fun! What a treat we have in store for you with this incredible hi-tech biofeedback tool that is designed to relax, relieve and restore our bodies and minds to an optimal balance. Wild Divine�s Healing Rhythms is an interactive program that we can use comfortably in our homes through our computers to assist us in managing stress more effectively. This is an in-home tool that can provide an arena for fun and challenging interactive learning for developing positive healthy strategies. Featuring Dr. Deepak Chopra, Dr. Andrew Weil and Dr. Dean Ornish, all accomplished medical doctors in their respective fi elds. They offer effective tips and strategies and valuable insights to help build our awareness to identify and change negative thought patterns and learn to cultivate positive emotions, all with just a few minutes of practice each day. Designed to work easily on both a Mac and PC, it comes complete with a sleek biofeedback unit that attaches to three fi ngers to measure and monitor our physiological states. These measurements monitor what is going on energetically in our bodies and provides visual clues and real time data to bring our bodies into restful healing states. Healing Rhythms measures two critical components: Skin Conductance Level (SCL) and Heart Rate Variability (HRV). SCL measures sweat gland activity through increased perspiration in our fi ngertips as it rises and falls with our physical and mental stress. HRV calculates the difference in heart rate from one heartbeat to another. By increasing your HRV, you can also improve brain and heart activity and boost your immune system,which helps you counter the negative effects of stress. From the moment you enter Healing Rhythms you are drawn into an soothing visual landscape of rippling water, slow fl ying birds and beautiful mountain scenery, all while being serenaded by calm, gentle music. A bonus of Healing Rhythms is that you are not dictated to doing anything in a prescribed order. You have the choice of a 15 step Guided Training program or a Self Exploration journey allowing you to switch between the two at any time. The Guided Training led by the doctors mentioned above consists of 15 steps that are divided into three sections. These are: Quieting the Mind, Observing Your Thoughts, Finding Inner Balance, Releasing Physical Tension, Cultivating Positive Emotions, Revealing Your Inner Wisdom, Subduing Your Inner Critic, Opening Yourself to Others, Practicing Compassion, Discovering Gratitude, Connecting with Something Outside of Yourself, Settings Your Intentions, Taking a Daily Supplement, Committing to a Personal Practice and Finding Your Rhythm. On the Self Exploration you can choose: Balance, Breathing, Invigoration, Mindfulness and Relaxation. In fact the exercises are so entertaining and rewarding oftentimes you are in such a hurry to complete one exercise so that you can go onto the next. Inevitably, your heart rate and physical tension increases, forcing you once again to breathe deeply and calm your thoughts. Some exercises will seem easy while others prove very challenging but that�s the whole point! Here is an example of a few of their exercises. The Breathing Tree: Allow your breath to fall in sync with the rhythm of the tree (which you can see moving) as it moves with the wind, blowing gently back and forth - in for a count of fi ve and out for fi ve. This is called the Heart Breath. Continue breathing slowing and deeply until a staircase begins to take shape before your eyes. Once you have suffi ciently built the staircase you are transported to the top of the staircase and view an entirely different scene. Juggling Balls: Lift the balls in the air by amplifying your energy. You can do this by taking deep energizing breaths, laughing out loud, or even just imagining a time when you were excited and happy. The balls will respond by fl ying upward. What you learn is the incredible power you have to control your mood and your energy, just by changing your thought pattern - and how your thoughts and feelings really do create your reality. Floating Balloons: Watch how your thoughts and energy affects the fl ight of the balloon. When you focus on uplifting or stimulating energy, the balloon follows suit and rises, and it sinks as you bring your energy down. The balloons respond to your inner atmosphere. Try letting go of the balloons so that they dance on the breeze of your thoughts, mirroring your breath. With daily practice this biofeedback tool functions as a mirror in which to view your inner workings- which can be very enlightening. It can help sharpen your awareness of your emotional, mental and spiritual states. This increased awareness will allow you to voluntarily shift your focus and attention, calm and center your mind and learn new patterns for coping with everyday stress. �How does one love and accept someone who has been hurtful to you?� The only way I know to move forward in life when someone has deeply hurt me, is to send them love and acceptance. We are all doing the best we can in each moment. It is important to recognize everything is divinely guided in life and as a result, sometimes bad things happen to good people. There is nothing one can do to change the other person. However, one can learn to set boundaries and be mindful of the need to protect oneself from hurtful people. By loving and accepting others exactly as they are, we release ourselves from the responsibility for taking care of them and expecting them to change. When I accept that someone I care about is hurtful, then I will ensure I take care of myself. I will call on the support in my life that empowers me as I move forward into a place of trust and self-confidence. This can sometimes be diffi cult with our family members. There are so many expectations in the process of loving our immediate family. However, as I have learned to love and accept my family exactly as they are, I have discovered I can remove myself from the drama and chaos and love them all for their genuine desire to seek love and approval. Loving and accepting others exactly as they are is truly the most important gift we can give to those we care about. It frees us from all expectations, allows us to see the other person in their own truth and step out of their way. It stops the blame game and encourages connection in so many new areas of our lives. The energy spent attempting to �fix� the other person is stopped and now there is room for new loving relationships to be nurtured instead. If you find the following affirmation difficult: I love and accept others exactly as they are, then try saying: I am willing to love and accept others exactly as they are. This affi rmation is a very powerful tool for releasing the past and opening the doors to forgiveness. Liz Robitaille now offers workshops at her Bowser location #205-6996 Island Highway, call her at 250-757-9794. In Tibet, As ELSEWHERE, Open Dialogue is Critical in "Educating the Heart"
The text below originally appeared as an Op-Ed piece in the April 9, 2008 on-line edition of the Globe and Mail. There are times when it is appropriate to turn the other cheek in the pursuit of peace, but it is never a good option to turn a blind eye - to stand mute in the face of injustice or ignore an act of aggression against the innocent. And so we, the trustees of the Dalai Lama Centre for Peace and Education, feel compelled to speak up about what is happening in Tibet. We have hesitated to do so precisely because some people will fi nd it predictable. Some may even accuse us of being part of what certain Chinese politicians are cynically deriding as the �Dalai clique.� But it would be wrong to assume that we care about Tibet only because of the Dalai Lama�s link to that region. In establishing the Vancouver-based DLC, we have been careful to create an organization that is apolitical and secular. The intent is not to laud one political position over another. It is to honour the Dalai Lama�s universal teachings - in particular, his insistence on nonviolence. We are speaking out against the use of force and urging the parties to this and other confl icts to choose dialogue as the fi rst step toward resolution. Our objection to what�s happening in Tibet is no different than our dismay at events in Darfur, Afghanistan or Iraq - in each case, we have lost the peace. We have lost the values that are most fundamental to the Dalai Lama�s teaching: kindness, compassion, patience, tolerance, nonviolence, dialogue, mutual understanding. We established the DLC because we were inspired by those values and by the example set by the man himself. Regardless of how others might characterize his actions, he has been unfailingly patient and perfectly consistent. He has offered dialogue and urged peace. That, in this new century, is a commodity that still evades our grasp. The world is well-armed for war, but poorly prepared for peace. There are war colleges in virtually every major capital - centres for tactics and strategy, think tanks dedicated to pressing an advantage. But there are too few institutions dedicated to studying and resolving human conflict. The DLC is dedicated to righting that balance in a unique way, concentrating on what the Dalai Lama calls �educating the heart.� He teaches that if you hope to be a force for peace, you must begin by searching for peace in your own heart. It is from that peace that we later fi nd kindness, compassion, patience, even forgiveness. The current confl ict in Tibet presents a challenge and an opportunity, a chance to reward those who have chosen nonviolence and to engage those are still inclined to fight. The first step must be dialogue, open and unconditional, and the chance for this may never have been better. After recent talks between British Prime Minister Gordon Brown and Chinese Premier Wen Jiabao, it appears that the groundwork has been laid. Now would be an opportune time for other world leaders to join Mr. Brown in urging this peaceful course - a moment for U.S. President George W. Bush, French President Nicholas Sarkozy and Canadian Prime Minister Stephen Harper to press strongly for dialogue and for peace. It is a testament to the Dalai Lama�s lifelong teachings that much of the world is united behind his quest for peace and his hope for his people. Against overwhelming physical superiority, it is only the force of world opinion that offers a chance for peaceful resolution. This is no time for brinksmanship. It is seldom the right moment for punishments or threats. It is, rather, a time to say to those perpetuating this confl ict that dialogue is the answer. It is also time to make it clear that we are watching - that we may forgive, but we will not look away. How fortunate we are to live in a time where alternate approaches to health care are increasingly accepted by society and mainstream medicine. Naturopathy, chiropractic, acupuncture, massage and Reiki are only a few of the many therapies available to us as we seek a more holistic approach to health. Although useful in disease, these therapies focus proactively on disease prevention and health maintenance. Animals also are benefi tting. Agility dogs often make use of chiropractic adjustments. One dog I know with inoperable hip dysphasia is being successfully treated with the insertion of gold beads by a veterinarian who is also an acupuncturist. In my own practice of Reiki for animals, it is gratifying to see depressed, pain-soaked, sedentary animals regain their interest in life and play after one or more treatments. Reiki is an ancient art that promotes health and deep relaxation in animals and humans. �Ki� is universal life energy, �Rei� means from the Source, in Japanese. Everything that is alive has life energy. However stress, injury, illness or the daily wear and tear upon our bodies and minds depletes this. Reiki restores the balance to our bodies by replenishing our lost energy and allowing our organs to normalize. Science has now proven that we are electromagnetic beings, with energy fi elds that can be measured. Each organ has a particular frequency signature. When the optimum state of functioning is compromised, disease results. This is as true for animals as it is for humans. It is not necessary to know all the scientifi c facts to channel Reiki energy. The body knows how to make use of the energy for best results. And very often this may not be only on the physical level. In my practice, I have seen remarkable healing of emotional trauma due to abuse, divorce or the death of a companion. Reiki does not replace the services of a veterinarian however it is useful in conjunction with veterinary care. Reiki enhances the effect of antibiotics; post surgery, reduces pain and anxiety and speeds healing. It has been given with great success to older animals with arthritis or rheumatism or while dying. At the very least Reiki achieves deep relaxation, producing a feeling of wellbeing. The relaxing infl uence of Reiki can be used while travelling, when any changes occur in the household such as a move or the introduction of another pet, and before competing in events such as dressage or flyball. Animals generally enjoy receiving the loving touch of Reiki. However it is important to respect the animal�s wishes. I believe that dogs, cats, horses, indeed all animals are sentient creatures, also on their path. I explain what I would like to do and go ahead only if there is permission. Just as in the human world, illness or injury may serve a higher purpose. Reiki never harms and only helps in ways individual to each client. Anne offers a mobile service , Gentle Touch Reiki for Animals, in the Cowichan Valley call her at 250-743-0727. Your soul is always communicating with you, in many different ways, but have you really heard the whispers from deep down in your core�your very essence? Most importantly, are you ready to hear your truth? Have you ever wondered why you are here on this earth and what it truly is that you are here to do? We all need to do a little soul searching every now and then, to remind us of our purpose. It is so easy to get caught up in the rat race of everyday life. Where is all the magic? The wonders are profoundly inside of you�in your sacred temple, right here, right now. Dive to the bottom of your endless ocean to find your truth�your goal, then grasp it with all of your heart and don�t let go. You will find the most beautiful bud waiting to blossom and shine your light. Expand your beauty and spread your radiance into the world. How do you create the life you always wanted? Simply by asking yourself what it is you have always wanted. Be honest with yourself, are you living your true existence? Do you wake up every morning and love who you are and what you do? What is unique about you? What inspires you? One of the keys to understanding your life purpose is to go back to when you were a child. What did you want to be when you grew up? Another sign to look for, is to ask what inspires you? What brings you happiness? I honestly believe that we are all here to experience a joyful life. There is so much more to you than you have ever imagined�you are a beautiful creation, here to do great things. Just your presence in the world can make it a better place. If you could hear the whispers of your soul right now, what would it be telling you? are you ready to make the changes necessary to fulfill your purpose? What are you waiting for�seize the moment, activate your destiny and live the life you always dreamed of. Isn�t it about time you Honored and Celebrated You? From coffee shops to pubs, to water cooler chat zones, global warming is a hot topic of discussion. The vast majority of scientists now agree that global warming is occurring and that our actions are having an impact on this change. I agree, but I also feel that there is another element of global warming, that is very good for humanity and mother earth. Our hearts are warming! Can you feel it? Humanity is becoming more caring, compassionate and loving. We care about the environment and all of the beautiful living creatures. We care about each other, our families, our communities and our own well-being. Individually and collectively, we want to see positive changes. Sometimes we might experience helpless feelings, since we are constantly bombarded with negative stories and images in the mainstay media. Fortunately, these feelings usually fade away as we rediscover hope and faith for our future. Our species is programmed to survive. The awareness for change is at an all time high. This awareness is transforming into actions for our governments, corporations, communities and individuals. For some of us this change might not be occurring fast enough or perhaps we feel that it is just too late. However, this does not mean that we should throw in the towel and give up. We owe it to future generations to make positive changes now. It is simple and it starts with promoting more LOVE. We have tremendous potential within us to effect change individually and collectively through the power of love! The root of most religions, cultures, traditions and belief systems can be traced back to an intention of love. Somewhere along the way, this intention of love may have been overgrown with other motives. It is time to trim away the decaying branches of greed, power and self-importance. The tree of love will grow stronger and spread its infl uence far and wide. This healthy love tree can absorb the negative stuff in our atmosphere and then emit the positive things that we need to live and breath in a healthy and more loving environment. It is happening right now. Look at the current trend of books, articles, debates and protests that are promoting positive environmental changes, democracy, improved human rights, solutions for the homeless, concern for our food supply, acceptance of those that seem different, anti-bullying campaigns, healthy living and more love for each other. Why is this happening - because we care! This awareness for change is the natural fertilizer that feeds the love tree. Our hearts are warming and we are ready for action. We have planted the seeds with our thoughts of love and now we can nurture the growth of love trees all around the world. Get out in nature, fi nd your love tree and hug it. Make positive choices for the environment. Help someone you might normally pass by. Speak up for change and attend peaceful protests. Write a positive article or book. SPRING...It�s the season of new birth, and yet it also seems to be a time of transitioning for many of our friends and loved ones. How does one deal with the emotional losses? What remnants do we hold onto and what do we release to be born again? The word remnants brings to mind bolts of coloured cloth - well not bolts exactly - more like bits and pieces. Hence I am reminded of a story/concept worth sharing. A while ago, my friend invited me to meet her close circle of friends for a clothing exchange and giveaway. Our common bond, was a mutual affection for a friend who had passed over. She was a yogi type and made her own clothes. As we raced past a few introductions on the porch and plopped down our potluck food, we tore up the stairs to the loft where the giggling got louder as about twenty women tried on her creations. Friends had seen her wear many costumes over the 50 odd years that she was on this earth. This was an event! I think she would have been smiling at the positions and shapes these women took as they jostled for space in front of the one and only full-length mirror. It was like a painting of abundance itself. Short ones, dark ones, long hair and blonds, 22 year olds, 55 year olds, the mix smiled at each other and commented with �wow-that-looksgreat- on-you�. �Let-meeee-try-it-on.� Some sat on bench seats watching the piles shift and fall and come back alive. Oh what a gift I thought. Clothes coming to life again. Looking in the mirror trying to get a corner to peek in, was like viewing the complexities of stained glasswork. Peering over each others shoulders one could see their legs and feet in her shoes as the reds, jingles of belly dancer golds, knits, hats and stockings lightened and brightened their spirits. Many of these wonderful woman who were strangers seconds before, were now celebrating as our mutual friend would have wished us to do. It took my breath away! It was the essence of sharing that touched me. A willingness and opportunity to let these creations come alive again. I sometimes relive the scene, as one does with a favourite movie. Today, Spring is the platform beneath our feet and Summer is fast approaching. Two seasons where LIGHTness is the order of the day. Lightness of spirit but also as in lightening one�s load. What if I wondered we could radiate as much joy by passing on hobby items and other �stuff� that lay in packaging in disarray behind our closet doors? No doubt we all have friends or acquaintances that could use our hidden treasures. What if we invited them over for an exchange night of laughter and free shopping? A party where people bring something they�ve bought and never used. They could also trade time for cooking meals and tending little ones for the treasures. Cash would not be the currency of the evening. Even better, what if we hung our unused garments on the clothesline - easy to see -colours waving in the wind-even easier for a friend to pick off! Some people get an adrenalin rush from the idea of shopping. I get one from giving away items I value. I think the energy we shift by changing the way we look at what we possess will also help heal Mother Earth. Janit Bianic (250) 331-3335 is a Clutterbuster and proponent for nurturing the land together as a family. For thousands of years man has been turning to himself, his physical body, in an attempt to understand more of the divine nature that he is. This quest has been illustrated in art, spoken of in religious texts and found in mathematics with the Golden Ratio and the Fibonacci Sequence; patterns that are mathematically calculated and are also found repeated within the human body. In religious texts, such as the Bible we fi nd quotes such as, �Do you not know that your body is a Temple of the Holy Spirit, who is in you, whom you have received from God?�. Therefore honor God with your body.� (1 Corinthians 6:19-20 NIV). My fi rst introduction into sacred geometry and the spiritual dimensions of our physical body was through a story of Dr. Sue Brown, a chiropractic teacher of mine. Dr. Brown was mapping out the geometric patterns that she was noticing in the spine and human body during chiropractic adjustments in which the body�s innate wisdom was adapting to, integrating, and evolving through various energetic patterns. During an airplane fl ight home, her neighboring passenger eagerly noticed the geometry she was working on. To Dr. Brown�s surprise, she found out that day that the detailed patterns that she was uncovering matched perfectly to the Tree of Life, which according to the teaching of the Kabbalah (the ancient book of Jewish mysticism) is considered to be the path on which spirit descended to become man and the path which man will travel to reconnect with spirit. You may be thinking, �Hey I thought you were just about cracking backs and helping my pain go away�. Interestingly, originally chiropractic was never about pain or back aches. The developer of chiropractic, D.D. Palmer, stated, �The purpose of the chiropractic adjustment is to reunite man the physical with man the spiritual, so that the fi nite may know itself as the infi nite.� The sole purpose of the adjustment is to align your spine with the divine so the divine can be maximally expressed through you. Growth, healing, wellbeing, spiritual evolution, and even a reduction of back pain is all a by-product of you being in alignment. The Tree of Life, or Etz haChayim in Hebrew, is a mystical symbol within the Kabbalah of esoteric Judaism used to describe the path to God and the manner in which He created the world out of nothing. The Kabbalists developed this concept into a full model of reality, using �the tree� to depict a �map� of Creation. The Tree of Life has 10 (sometimes 11) Sephirot (circles) and 22 (sometimes 24) interconnecting paths. Each Sephirah and path are said to have a different characteristic�a different number, letter, physical feature, planet, etc. Of course there is disagreement over the attributes among modern Kabbalists. Even the earliest texts don�t always agree with each other. However, because of the secrecy surrounding the Kabbalah�s origins as an oral tradition (the word Kabbalah�s Hebrew origins means �mouth to ear�) and because The Tree is put forth by Kabbalists as ultimately a human perspective of Truth, the individual must ultimately come to his own interpretation, using the very comprehensive system of correspondences and ancient wisdom provided. The diagram represents the process by which Kabbalists believe the universe came into being. Their explanation is startingly similar to that given by modern scientists in various fi elds. Science generally accepts the idea that the universe began from a singularity, a dot in the centre of nothingness containing possibly infi nite energy. The energy next went through a stage of cooling as it expanded into space and time.The hot energy of the Big Bang and the coldness of space cooperated to create the material of the universe and formed the first atoms and galaxies. The spheres are arranged in three columns. The right column is called the Pillar of Mercy. This represents the male side of man and also contains three sephira: Chokmah (Wisdom), Chesed (Mercy) and Netzach (Victory). You could literally spend your whole life studying the ancient wisdom contained here. So we just gave you a brief intro into it basic patterns. If this triggers something for you, Google it, and do some research of your own! First of all I�d like to thank all of you who responded personally to the last article. Your comments, stimulating discussion and questions have opened the way for this next topic. Here are some questions and comments that perhaps will help guide you to a benefi cial experience in the field of vibrational healing. Is the service being offered something to which I am open? Your openness is a gift of grace and indicates your readiness. It is also the greatest gift that you can present to the practitioner. It prepares the both of you for the highest potential of your time together in session. Don�t forget that when two people work with focus, the energy increases exponentially. So when both are ready, without resistance, your chances of doing effective work together are enhanced. If you are feeling somewhat apprehensive, a willingness to embrace the next stage of your journey and engage your personal power speaks loudly of your intent. It is an honorable place to be and one to which �The Universe� responds without fail. When you fly from here you can be assured that something will shift/transform/transmute for you. * Those of you who like being touched or feel a need to be touched will have an innate appreciation for the �hands on techniques� as opposed to methods that work only in the auric field. * Do you have a fascination for crystals and gems? Your awe or natural curiosity toward the �tools� that the energy worker uses will allow you to feel in resonance with his/her practice. Consider that an energy worker who has a variety of tools or methods of work will be able to tailor-make the session to suit your particular needs. This is an opportunity for you to voice preferences and participate in the creation of your experience or just as valid, surrender and enjoy the ride. *An avid gardener will appreciate and feel a receptivity to flower essences and herbal preparations as opposed to someone whose primary interest is in �latest technology�. Allow your inner radar to help you fi nd a practitioner whose �tool kit� allows you to feel comfortable and at ease through affi nity, magnetism or the Law of Attraction. Synchronistic events have led me to this person, the Universe is �nudging� me. The fee is within my means and I feel good about the exchange. I feel a �quickening� when I�m around him/her. They radiate a sense of healthy esteem. They glow with peaceful presence. They �in joy� and come from a place of passion for their work. These points I�m making fit into the observational, analytical approach to decision making. Perhaps the most important exercise around any query is to quiet the mind, sit in silence and go within. ASK! God/Source/ Great Spirit will fi nd a way to speak to you and show the way. In this process you will open the potential for a personal intimate relationship with the Loving Presence from which we all come. Immerse yourself in Oneness�the answers are there. These are guidelines that have helped to steer me along the way as a �player� in this energy fi eld. However, can I please help you to remember this? Everything we experience along the way is appropriate. There are no mistakes, there is only experience. Sometimes we create an event in our lives just to show us clearly what we don�t want!!! Sometimes a �bummer� experience brings with it the understanding of an issue that needs to be looked at fi rst before progress can be made in other areas of our lives. Choose to be at peace about it all and trust yourselves! Jump off that cliff and just enjoy your flight!!! Blessings along the way! Delaine Walsh may be contacted at 250-248-8074 for an energetic assortment of services to suit your needs. Most people don�t think about singing when they think about revolution. But song was the weapon of choice when Estonians sought to free themselves from decades of Soviet occupation. �The Singing Revolution� is an inspiring account of one nation�s dramatic rebirth. It is the story of humankind�s irrepressible drive for freedom and self-determination. We think you will be inspired and energized by the remarkable events in Estonia in the late-1980s. We want to share this inspiring story with those who know little about Estonia. Absent a Hollywood marketing budget, this guerilla marketing strategy is our best hope. If the fi lm does well, the theaters may keep it longer. Please help spread the word. Thank you! Traditional Thai Massage, also known as Nuad-Bo-Barn in its traditional medical form is a type of oriental bodywork therapy. It was founded by Dr. Jivako Kumar Baccha, Buddha�s personal physician. In the West, it is commonly known as �yoga massage� since it reaps the same benefi ts as practicing yoga. This therapy is performed fully clothed on a mat on the fl oor. It is a holistic therapy that combines acupressure, manipulative massage, and assisted stretching. Thai Massage treats the electromagnetic or energetic fi eld which surrounds, infuses and brings the body to life. Traditional Thai Massage uses energy lines in the body called �Sen� and though may appear to be similar to Chinese acupressure, the energy theory is very different. The �Sen� follow the fl ow of energy through the whole body; whereas the meridians of Chinese acupuncture represent the energy fl ow associated with specifi c body organs. In the tradition of Ancient Thai Massage there are 72,000 �Sen�, but in practice there are ten �Sen� which serve as the foundation of all the energy lines. The work of Traditional Thai Massage consists primarily of pressure on the body�s energy lines and pressure points, along with a variety of stretching movements. The practitioner exerts pressure using the palms, the thumbs and the feet, and occasionally the elbows. This is always done, however, with the practitioner�s whole body weight serving as the pressure force. Relieves fatigue, swollen limbs, painful joints and headaches. The stretching movements of Thai Massage open up the body up and has the effect of both relaxing and energizing the body. The stretching movements along with the pressure on the energy lines and pressure points are what give Thai Massage a whole body effect. Traditional Thai Massage or Yoga Massage is practiced with the consciousness that the body is a creation of energetic circuits that are so interconnected as to not be separate. Working with energy lines that fl ow through the body linking each piece to the whole, one is able to re-connect and increase awareness on all levels. These treatments range from 1.5 to 2 hours which gives the body time to incorporate this consciousness of unity. OH PEACE and LOVE! GLORIOUS PEACE AND LOVE - such sweet sounds to our ears, whether they be furry or not. Well you can bet my paws and whiskers, that this is the season where it all begins. Possies in the garden ready to pop up in a bouquet of fresh colours. Little birdies in the nests... AH YES... little birdies in the nest. Life isn�t always all cupcakes and roses you know, for a guy like myself, a BIG guy I might add...fl ying up that tree would be so easy. A thought surfaces in my mind and I remember chasing the birdies as great sport. Hummm I can�t say when it all changed really, perhaps it hasn�t changed at all... perhaps I�ve become more disciplined in my old age. When I think about it, I wouldn�t want someone coming to my house and running off with my children so I try to imagine what it is like for another, try to imagine everyone living together as one. Ok...so let�s face it. It isn�t always easy. It takes considerable effort to control our emotions and instincts most of the time. Yup me and you together, you likely wanting to lash out at your co-workers, cause them a little trouble now and again, cause after all they likely deserve it (in your mind that is!) In reality, I suspect their life to you, is like the birdies in the trees for me. They are just trying their best to do what they have to do to live and keep the family together. Not really intending to cause you trouble and �tempt you on purpose�. Well OK maybe some people are a bit like that...same as the crows dive bomb the eagles sitting in the trees minding their own business. Every once in awhile, there is what you call an instigator, but that�s where the peaceful challenge comes in. Rising up above the norm for your species and answering with love. I hear my mom sing sometimes �whatever the question, love is the answer!� It makes me feel good... makes me feel like I�m really smart... to know the answer to every question! Sometimes she call me her �little prince� and tells me and the �backdoor visitors� that we have to get along and be nice to each other. �It is the only fi tting way to behave when you are acting like True Royalty.� Boy, that one got me. What if everyone lived their life as if they were royalty, a group the entire world looked up to for inspiration and guidance. What if everyone began to nourish the little prince or princesses inside and allowed them room to grow and be the ancient wise one that they really are. Boy, the thought makes my white heart expand! Imagine if every pet and person were reminded that they were exceptionally special and every day would be a good day to try a little harder to live the dream. I suppose you could say a wave of inner contentment surfaces and there IS hope for everyone. I think we can make better choices when we remember that our source is �the fi nest of the fi ne� and our behaviour befi ts the garmets of a king. Boy, how was that for a little �soap box song and dance!� I think I should ask my mom for a new set of duds to go along with my speech or purr-haps just a treat from the kitty cookie bag - a little reward for not running up the tree! There are some mysteries in the world that seem to fascinate mortals more than others. Starting with questions such as: Who built the pyramids? How do we explain crop circles or Stonehenge? Eventually we arrive at what about those crystal skulls? Made from various types of quartz crystal (clear, amethyst, smoky, rose, etc.) they are also referred to as Crystal Heads. Although it means the same thing, this term has a gentler resonance to it, a more human connotation and is vibrationally more joyful and friendly. Many believe these attributes are more true to the real nature of these amazing tools of loving transformation. Currently there are three main age categories: NEW or Contemporary � manufactured by modern carvers mainly since the mid1990�s primarily carved in Brazil and China. OLD � created 100 to 1000 years ago. In both of these cases, some type of tool mark was left by the carver. ANCIENT� created from 1500 to many thousands of years ago having no tool marks. Very few that exist today are in this category. are they done by hand or with advanced technology like �thought projection�? Some believe they are a �gifts� from some higher celestial intelligence or were made by advanced cultures like Atlantis or Lemuria. Wherever these Ancient ones came from, there is a defi nite connection between the crystal skulls and the Mayans, Aztecs and some Native American sources. In most cases, the heads are linked to sacred world prophecies held by indigenous people. Many guardians of the crystal skulls are protective and often secretive as they consider the treasures to be very sacred and take their responsibility for them very seriously. Many indigenous people speak of their remarkable magical and healing properties. T h i r t e e n crystal skulls of apparently ancient origin have been found in parts of Mexico, Central America and South America, comprising one of the most fascinating subjects of 20th Century archaeology. Some are believed to be between 5,000 and 36,000 years old. The most famous and mysterious crystal skull is the Mitchell-Hedges. It weighs 11.7 pounds and is about fi ve inches high, fi ve inches wide, and seven inches long. Except for slight anomalies in the temples and cheekbones, it is a virtually anatomically correct replica of a human skull, even featuring a fi tted removable jawbone. It is made of clear quartz crystal, and both cranium and mandible are believed to have come from the same solid block. Others crystal heads are more stylized, often with unrealistic features and teeth that are simply etched onto a single quartz piece. In 1970 the Mitchell-Hedges family graciously loaned the head to Hewlett-Packard Laboratories for extensive study, which yielded some startling results. Researchers found that it had been carved against the natural axis of the crystal. Modern sculptors always take into account the axis, or orientation of the crystal�s molecular symmetry, because if they carve �against the grain,� the piece is bound to shatter -- even with the use of lasers and other high-tech cutting methods. HP could fi nd no microscopic scratches on the crystal which would indicate it had been carved with metal instruments. The best hypothesis for the skull�s construction is that it was roughly hewn out with diamonds, and then the detail work was meticulously done with a gentle solution of silicon sand and water. The job would have required man-hours adding up to 300 years to complete. Thus experts believe that successfully crafting a shape as complex as the Mitchell-Hedges skull is currently impossible. Here are some of the other better known heads. The British Crystal Skull: in the British Museum of Man in London, England since 1898 - one piece clear quartz full size head. The Paris Crystal Skull: in the Trocadero Museum in Paris, France. Mayan Crystal Skull and the Amethyst Skull: discovered in the early 1900�s in Guatemala and Mexico, respectively, and brought to the U.S. by a Mayan priest. Studied at HP, and also found to be cut against the axis. Texas Crystal Skull (Max): a single-piece, clear skull -18 lbs. Reportedly originated in Guatemala, then passed from a Tibetan spiritualist to JoAnn Parks. ET Skull: a smoky quartz found in the early 20th Century in Central America has a pointed cranium and exaggerated overbite to make it look like an alien. Rose Quartz Crystal Skull: comes close to resembling the Mitchell-Hedges -reportedly found near the border of Honduras and Guatemala. Slightly larger than the Mitchell-Hedges, it has a comparable level of craftsmanship, including a removable mandible. The stories of the discovery of many of the heads are surrounded by massive controversy, and questions of their authenticity. More recent studies of a number of artifacts of supposedly ancient origin conducted at the British Museum using electron microscopes, revealed that two of the skulls possessed straight, perfectly-spaced surface markings, indicating the use of a modern polishing wheel. Genuine ancient objects would show haphazard tiny scratches from the handpolishing process. The report speculated that these skulls were actually made in Germany within the past 150 years. Still the question remains is does it really matter exactly when and who? 100 or 10,000 years is it all that important to know. It would seem from a more enlightened perspective, that the date the carver met the stone is not as important as when the head decided that the people were ready for it to wake up again. Quartz is a most amazing tool of transformation and when it chooses to become a head something special happens. Love Awakens! When in the �appropriate� company, some believe that crystal is capable of accessing ancient information and the connection between its shape and your own creates a unique pathway for it to communicate through. There are prophecies that when the 13 crystal heads reunite in the same place together, forming an energetic grid work, they will assist human consciousness to evolve and return to its natural state of light. Human consciousness will remember its soul�s purpose. Many believe the skulls are containers of great knowledge and are holding information about the history of the planet, the evolution of mankind and our future destiny. When that time comes humanity will be ready to understand the messages. The concept of 12 plus 1 is not new as a tool of transformation. Consider these examples: The Crystal skull grid matrix - The Zodiac - Jesus and his disciples - King arthur and 12 knights of the round table just to name a few. Putting legend aside for a moment, it has been observed that simply sitting in the presence of one of these old masters is enough to activate another whole universe within. The heads literally light up with joy. Although often considered the symbol of death, it would appear more appropriate to consider the symbology that death is merely shedding the old and preparing to receive the new. Our physical bodies are becoming more energetically and vibrationally aware and the crystalline structures within are truly waking up. To know that these old and new friends from forever are alive and well on planet earth with us, is reassuring. To catch a glimpse of them in a museum, a shop window or in the dream time, is still a treat as a surge of old remembrance rushes through. Big ones, little ones, clear and not so clear, the Happy Heads are rising up to serve you, spiraling a more precise vibration to guide you along the way. How sweet it is... how it simply comes back to LOVE. In a few short closing words...the crystal heads are ALL about LOVE. It is with a salute, a misty eye and a tip of the EAGLE�s wing that we inform you Paul�s recent transition to a place he calls home. EAGLEye�s relationship with Paul goes back to our very fi rst issue in 1993 when I opened an envelope one day and out poured words of praise and encouragement for our purple ink and what it represented. �I�ve waited a long time for people to start talking openly about things like this�, he said. �Please continue.� Who was this man I wondered? From the beginnings of that fi rst letter, Paul would often send �little� and �not so little� contemplations and inspirations for us to share with you. In truth, he sent an astounding amount of material over the years. Indeed he could fi ll volumes, for Paul was a man who led the way with thoughts and words far ahead of his time. He was a guy who dreamed to pass the torch of verbal eloquence to younger folk who would take it to another level again. In 1994 he submitted his delightful creation to our fi rst �you�re never too old to colour� contest and obviously won for being the oldest contributor at the ripe old age of 82. Indeed he challenged his own generation to get off their rocker and colour the world beautiful. Paul was about as perfect as any of us ever are! �I�m a cranky old thing� he said to me once on the telephone, �but I�m trying to improve my ways. It�s a good thing God gives us more than one chance.� We laughed a hearty laugh together. We both knew the truth about the world and each other. We all have days we wish we could relive again and days where we could do no wrong! But the everlasting beauty is each day we are given another chance to improve upon the last. Paul was a gentleman who encouraged us to �keep printing purple pages� when it would have been much easier to throw in the towel. I�m sure right now, Paul is looking down from his lofty perch, with the same interest and curiosity he always had in life. Sending a new found quality of love and inspiration, that is hard to capture on planet earth - the kind he always imagined possible. And so we acknowledge the passing of a mentor to many. Hats on and hats off to you Paul, A True Prince of Light. Ah how the cycles of light spin within your planet in these times. How the patterns weave complex memories for your inner light to follow. It is the time of tapping the bells inside your beautiful crystalline selves. A time to be joyous and expand the brilliance of the infi nite you into the density of this planet of �potential� transformation. We say �potential� because you are now on �energetic alert�. This term will resonate with some of you. It is an old code - a trigger to inspire you to quickly come to attention in your fi nest and fullest energetic brilliance. Remember we say to you how the words were meant to trigger a divine guardianship from seeds planted by your very selves. Each of you is an energetic gardener of sorts - a master temple architect from forever. Each of you eons ago �packed your own parachute� so to speak to ensure YOU had the tools to utilize when the time was right -to complete your personal series of service. The concept was that between many of you, at the time of awakening, you would have everything you needed, without all the responsibility being placed on one physical body. Rather it would be the coming together of your hearts and spirits in vibrational majesty that would create the symphony of creation from all the bits and pieces. Like all clever gardeners, you made sure there was a surplus of seeds sown to compensate for the potential mishaps along the way. Extra seeds sown to balance the scales in the event some who began the quest, diverted to other pathways in the hallways of timelessness. Some of you would question your motives and wonder if the idea was built with the potential to fail subliminally. Not at all dearly beloved. Rather the many seeds sown would speed up the process of transformation if none were lost...and also create a dormant backup wave of potential if everyone did not resonate to the call at the same time. Energetic alert was the sound of the light increasing and the water purifying to nurture your seeds within. Oh such Love... such Abundance... such Creativity this year brings to you. A year of infi nite possibilities within the power of the One. Sparks of light dissolving old energetic patterns that do not serve you in these times. Imagine the perfect you, golden transparent light radiating all around you, vibrating within you. Love for yourself beyond any others...love for ALL others within yourself. You are a case study in the power of crystalline perfection. Your inner selves are the pure expansion of the universe itself...the voices of the Divine are resonating within you. It is time now to speed up your journey, not by running here and there but by accelerating the vibrational codes within. The crystalline transparent vehicle that you are is real, the illusion is that it is an illusion and the real illusion is that you have convinced yourselves that it is a fantasy. Today the chimes sound in the heavens and resonate in the heart of mother earth... the crystalline patterns, set to activate at the perfect time for you, are resonating within and all around now. Such love the gardener has for its creations, such hope for their growth and with such care tends the fertile seeds. KNOW you are the seeds sown from the highest of the high eons ago...know the source from whence you came is ready to serve you now in ways you could not dream of with your earthly minds. Thus we say to you...it IS a GOOD TIME to bypass the mind and start direct from the heart... a good time to listen to your inner rhythms and inter-connectedness with all things. Your whales and water-beings, your fairies and fl ower spirits, your four-leggeds and winged ones - the list goes on and on and on - for everything is included. Your crystalline voices from the stones around and within you begin to speak up in your presence...the ones who have watched silently are also hearing the call. Wake up...wake up NOW. And so they do also...and so they search you out...following your inner light...reaching out in the dreamtime...dancing beyond the �possible� into a new paradigm of consciousness that is reserved for the one who hears the invitation. The crystalline heads strategically placed on planet earth to inspire you, are slowing looking around for ones ready to live the dream. Their visual presence is a great trigger for ALL GOOD once again, as has always been their destiny. And yet the crystal heads emerging from the ancient or not so ancient carvers are much like yourselves. They have been waiting on the surface or waiting to be carved in these times...it does not matter...when the time is right, when the crystal and their keepers come together in loving unity..then the magic will begin. The heads fascinate many of you for good reason; they are indeed ancient tools that have returned to serve you, ready for a new beginning. Power and perfection balanced as one vibration... as it should be and as it IS. They are reuniting the seeds of creation� - whatever their form. We are speaking of the �heart of creation that resides within each of you at this time. A PRISTINE LOVE that has been waiting for your doors and windows of light to open...to BE active again. To be on energetic alert is to be precisely aware at all times of the consequences of your actions...of the power of your love to recreate the world as you know it. To assume responsibility for every step you take and to ensure that every breath is a gift of love. It is to dissolve the fear and anger because you have suddenly and brilliantly connected to your source where there is no fear. No need to be �better than another�..no reason to scuffl e with each other. For you recognize that the gardener that tends to your spirit, is All Giving, All Gracious, infi nitely capable of loving each seed with perfect equality, prepared to assist each seed in a unique and individual way. That in the beginning and in the end, the whole will be served as the whole serves itself and each other. And so it is on this day of your earth time as it is also beyond the veils in the place of timelessness...a limitless reign of light descends for your utilization and the light of such grandeur and freedom is all encompassing. Searching out the ones who feel the resonance - that mysterious silent voice vibrating within - wake up - the call to alert has sounded....wake up...the one is waiting for your golden self to reappear once again. I gotta tell you about something that I love. It�s about the gold liquid healing light you got inside of you. In a way, it�s kind of like the golden amber in the trees...a liquid love...a life line. You and the trees are more alike than you might realize. In the old days the chiefs went to the big trees for solid council and they always got the answers they were looking for. The trees were strong and healthy then, just like the people. Today things are different... but one thing is still the same, the trees have that gift of amber love and you have the ability to listen. The trees still carry the gift of the quiet within and they can teach you. I know sometimes you don�t like to listen, you like to think you got all the answers yourself. Sometimes you�d rather get yourself in trouble before you�ll accept help from another...it�s a strange thing I tell you. So today I�d like to say that at least if you don�t listen to each other, you might still think about listening to the trees. A lot of them are gone but there are still some who are waiting for you to visit. Some of the really old ones have already given you amber treasures...but you just think it is pretty jewelery. Dragonfl y says, why not dig it out and look again. Amber comes right from the heart of the tree...golden liquid healing love. It can teach you something real simple. It can teach you how to fi nd the same golden, liquid love inside yourself. So golden it becomes invisible to the eyes. That is powerful medicine...and you are powerful people - especially when you are smart enough to listen to the wind and the stars and the trees and each other. Sometimes it�s good to paddle your own canoe - but sometimes you�ll get where you�re going quicker if you paddle with all of your people! My name is Grandfather Dragonfl y and I Love You - bigger than you can imagine.